. . . WOODY WITT . . . Composer, performer and educator, Woody Witt is a saxophonist setting his tone as a leader in the jazz world today. His fresh ideas and original approach to improvisation and composition have earned him a place to perform with some of the top names in the industry. Woody's first CD, released in 2002, launched him into the recording industry with a sense of newfound passion. With the international release of his second CD, "Square Peg, Round Hole," on Apria Records, the world jazz community should take notice. Woody teamed up with world renown jazz artists Randy Brecker (trumpet), David Kikoski (piano), Johannes Weidenmueller (bass) and Ari Hoenig (drums) to record eight of his original compositions. Woody has established himself as a notable musician and has performed with the Houston Symphony Exxon-Mobil Pops Series backing artists including Ray Charles, Kenny Rogers and Tony Bennett. His musical journey has offered him stints with the touring Broadway production of 42nd Street as well as Tommy Tune. He has premiered new works that break down barriers between the musical genres of classical and jazz as a featured soloist on "Up South" for jazz ensemble and orchestra and "Three Musicians," a work for soprano saxophone, guitar and bass, both by noted composer, Dr. Robert Nelson. Woody is also the manager/artistic director of one of the city's only jazz clubs - Cezanne. In addition to maintaining a full performing schedule, his career has led him to adjudicate many jazz festivals: University of Houston, University of Texas, GCIC, McNeese State, Harlingen and others. While attaining his Doctorate in Musical Arts at the University of Houston Moores School of Music, he discovered improvisation is the most free form of musical expression - this is his tool in striving for purity of sound and clearly presenting musical ideas. Dr. Woody holds a Masters degree in Jazz Studies from the prestigious University of North Texas where he taught saxophone and jazz methods. He was named the Outstanding Graduate Student in 1995. He received a Doctor of Musical Arts degree from the Moores School of Music at the University of Houston in 2000. 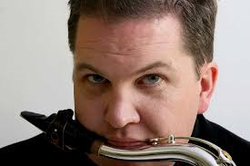 Woody Witt is a full time instructor at Houston Community College and is an affiliate artist at the University of Houston Moores School of Music.